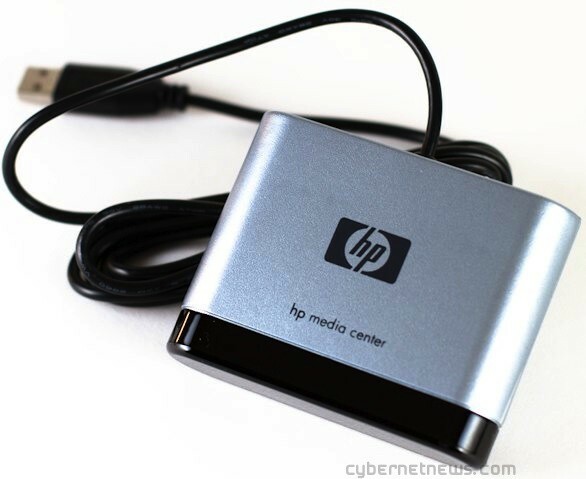 I recently decided to make the jump from using Windows Media Center to XBMC as the primary way we watch media on our TVs. The nice thing with Windows Media Center is that you can use the Xbox 360 as an extender making it a no-brainer to access the content anywhere you have an Xbox in your house, but the lack of customizability was really starting to get to me. 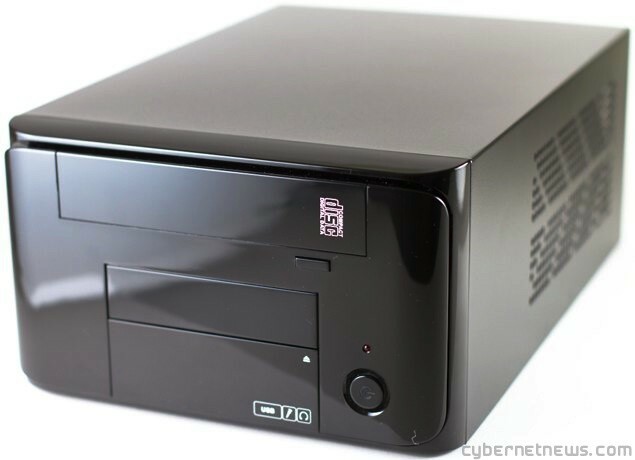 I started to look at some of the smaller home theater PCs (HTPCs) that are made by various manufacturers, but for what you get they are drastically overpriced (albeit they are normally crammed into nice compact cases). 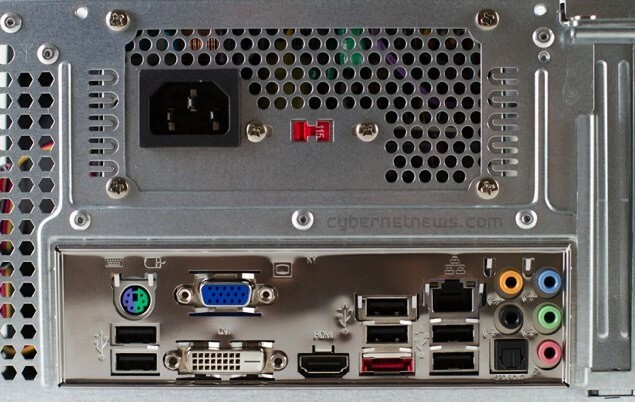 So I decided to build my own HTPC that could handle the exact needs of XBMC including 1080p playback. For $5 more there is also a model of the same motherboard that replaces 2 of the rear USB 2.0 ports with USB 3.0 ports. The motherboard only supports DDR3-1066, but due to backwards compatibility you might as well just grab some DDR3-1333. The motherboard can also handle up to 16GB of memory split across the 2 slots. I chose to grab just one 4GB stick, which means that I can upgrade to 8GB rather simply should I decide I ever need it. Noise level is rated at 10.70 dBA, which is extremely quiet for a computer fan. I provided the Amazon link for this as well because it includes free shipping, whereas Newegg charged $10 to have the case shipped. The case is 11.80″ x 8.70″ x 5.1″, which is significantly larger than something like the Apple TV but also has more power and versatility. You can use any RC6-compatible IR receiver, but the HP models have been found to be some of the most compatible. I’ll jump into this a bit later since there are also various models of the HP IR receiver. The motherboard includes a fan on the CPU, but if you’re concerned with overheating (and you probably should be) I’d recommend grabbing a 120mm case fan. Since there is a good chance that the machine will be sitting out in the open make sure you look at the noise level (dBA) of the fan to ensure it’s designed to be as quiet as possible. This particular Scythe model is 800 RPM and from a noise perspective is just 10.70 dBA. 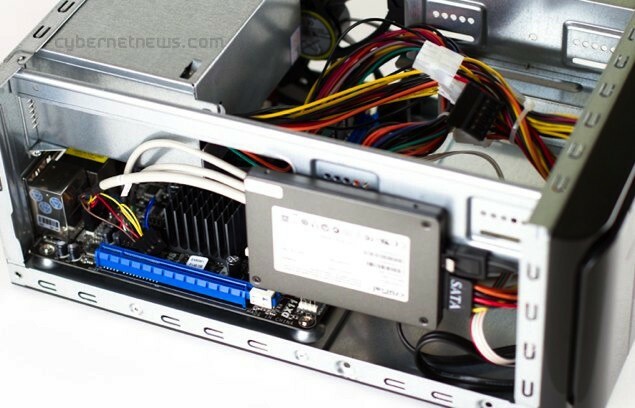 The fan, pictured below, takes a little force to get it to pop in the side of the case, but that also means you won’t need any screws to hold it in. After you put in the fan, you need to make sure that you’re able to freely spin it without any of the blades touching the frame of the fan. The first time I put it in the case it was in place where there was a little too much pressure being exerted on the fan causing the blades to touch the frame when they would spin. I simply took it out, moved it down another inch, and had absolutely no issues after that. You’ll also want to make note of the direction you face the fan. Some people say you want to pull air into the case while others say to push it out. The way I have it placed in the photo makes it pull the air in, then it flows across the motherboard, and will exit the case on the other side. I decided to spring for an SSD given the huge performance gains you get over the typical hard drive. I lose a lot of storage capacity going this route, but this device isn’t the one storing all of my media. Instead I have that streamed from another machine, or you could easily add more drives through USB or internally using the 4 internal SATA III ports. The motherboard does come with a 6.0Gb/s SATA III cable so you won’t have to worry about picking one of those up. When determining the size of the SSD make sure you consider the operating system you’ll be placing on the drive. With Windows 7 you’ll need at least 16GB for the 32-bit version and 20GB for the 64-bit version. Comparing the price of the 32GB and 64GB drives I saw a very small difference, which is why I decided to go with the 64GB. The case also has a couple of ports on the front that you can use. It includes 2 USB 2.0 ports, a microphone port, and a headphone port. 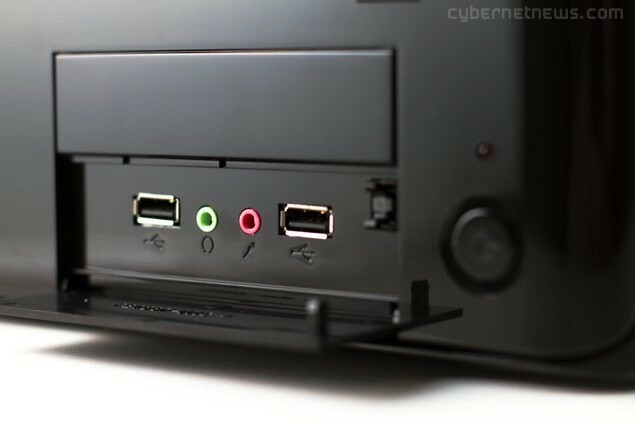 I love having the USB ports on the front because I don’t keep a keyboard or mouse plugged into this, and if I need to go into the BIOS to make some changes it’s nice and easy to pop down the front cover and plug the devices in. When everything is done you can throw the cover on the case and enjoy your hard work. Here you can see that the front of the case has a glossy appearance serving as a magnet for fingerprints, while the rest of the case is a matte-like finish. This particular case gives you room to grow as well. There are definitely some more compact cases available, but with this you could easily add a DVD drive in case you wanted to watch a movie from your physical collection. If you want to go with a more compact case you’ll want to think about the ventilation because some of the reviews I read on them had users frequently mentioning how their devices would overheat when streaming media. That’s another reason installing a generous 120mm case fan is a good idea. I already have plenty of remote controls that I knew would work with this IR receiver before I purchased it. Both my Xbox 360 Universal Media Remotes as well as my Logitech Harmony Remote had no troubles working with this receiver on Windows 7, and the drivers for the device were automatically installed. It does take some tweaks getting it to work depending on the remote you have, but we will cover that in a future article. This is the most highly recommended model, but the trick is finding someone that is actually selling it. If you can find this model I’d recommend getting it as it’s been known to work well on both the Windows and Linux side. This is the model I purchased and had no troubles getting it to work on Windows 7. This seems to be one of the more common models and should be relatively easy to find on eBay. I don’t know much about this one, but I suspect it would also work well on the Windows side. You just need to be careful when buying these on eBay because there are a lot of knockoffs out there. 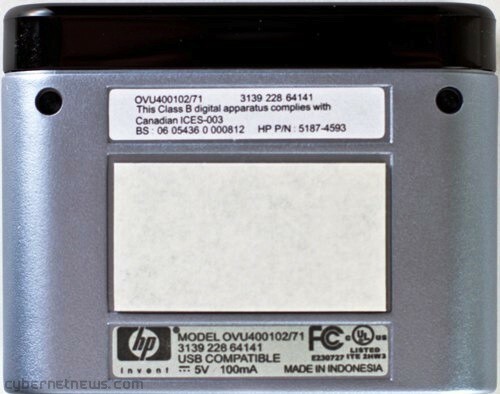 Not only that but sellers of these devices will often label them as being the OVU400103/00 model whereas what you actually receive may be another model. I’m guessing this is because many of them just have boxes of mixed models sitting in their warehouse not realizing they are actually different since they look the same. Over the coming weeks we will have a bunch more XBMC articles and guides coming your way. So stay tuned if you want even more info on getting this unit set up perfectly.